RiskWise Property Review has performed research into OTP properties to identify and measure success and failure factors. We have applied the results in our new comprehensive reports, which outline the best and worst OTP areas in Australia. Investors may be surprised to learn that an off-the-plan (OTP) property generally carries a higher risk and delivers a lower return than an existing property. This is because, in addition to the typical risks associated with a property investment, an OTP dwelling is also exposed to further risks. These include settlement risk (i.e. not having access to the funds required to settle), and oversupply risks, when a significant sudden floods of new dwelling (mainly investment properties) are released to the area. Currently, more than 300,000 units are in the pipeline and are planned to be completed Australia-wide over the next two years. Some areas with significant supply of OTP properties have been flagged by the RBA as high-risk investments and also major lenders have set lending restrictions and created ‘ blacklists’ for some areas. Overall, the vast majority of current OTP properties are in high-risk areas. However, some OTP properties have delivered very strong capital growth and have proven to be very good investments. Therefore, we have conducted detailed research into both houses and units as OTP properties to determine the best investment attributes. This has resulted in our detailed reports on the best and worst OTP suburbs in Australia for houses and units. Our reports also include the preferred configuration for each property type. For our research, we have analysed all suburbs across Australia with a significant number of OTP properties; the average number of new dwellings, either houses or units, between 2011-2015 in these areas was 2,720. This is undoubtedly, for both houses and units, the number one success factor. Dwellings in suburbs that are located in a region with sustainable economic growth outperformed the national benchmark in 90% of the cases, delivering an average 5-year growth of 48%. In contrast, only 43% of the suburbs with no sustainable economic growth outperformed the benchmark, delivering an average 5-year growth of 10.4%. For example, although there were 4,873 new units in Waterloo, the 5-year growth is 60.1%. On the other hand, Perth with a poor economy had a negative 5-year growth of -2.1%. A low proportion of new units in the city has a strong correlation with high capital growth. Suburbs that met this criteria outperformed the benchmark in 85% of cases, delivering 5-year growth of 50.3%. Areas with a high proportion of new units outperformed the benchmark in only 63% of the cases, delivering 30% capital growth in the period. Considering only the number of units in the suburb alone is insufficient, however. Our research shows that the addition of units to the entire area needs to be taken into consideration. For example, in Botany there were 5,449 new units, but due to an undersupply of residential properties in the surrounding area, there has been strong capital growth of 44.7% over the past 5 years. 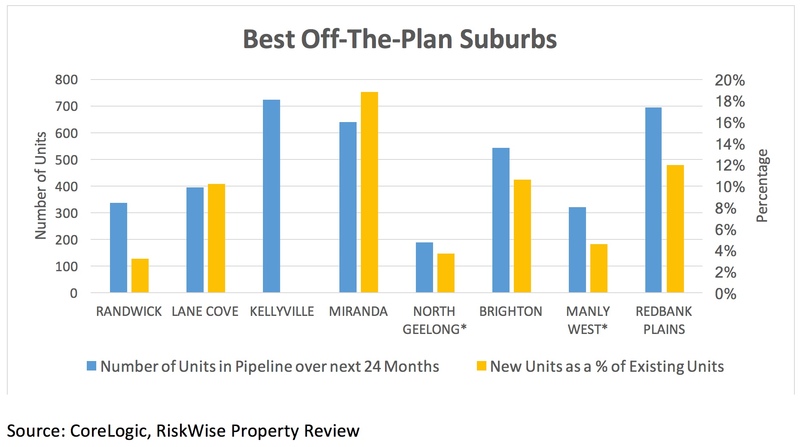 However Brunswick, with an additional 1,400, units had a relatively modest capital growth of 17.7% in the past 5 years, due to the large number of new units in the area. OTP houses outperformed OTP units in the same area. For example, houses in Baulkham Hills had a 5-year growth of 84.8%, versus units with 51.9%, despite the fact that in both cases, the number of new dwellings was around 2,000. The previous finding is well connected to another finding: that OTP units in suburbs with a higher median price delivered stronger results. Suburbs with higher medians outperformed the benchmark in 85% of cases, against 70% in suburbs with a lower median price for units. In both cases, these were family oriented suburbs with a relatively high median house, where large units that suit for families are a good, affordable dwelling alternative for people who want to reside in these suburbs. Where an OTP unit cost less than 45% of the median house price in the suburb, the capital growth of units was generally higher than units in suburbs where the median price of a unit was 60% to 70% of the median house price. For both houses and units, OTP properties bought in areas with a renter ratio lower than 50% have delivered 5-year growth of 41.6%. However, areas with a renter ratio higher than 70% had, on average, 22.3% 5-year growth. Where Are The Best and Worst OTP Areas in Australia Now? We have applied our research results to identify the best and the worst OTP areas in Australia. Our first step was to assess the potential sustainable growth, including measures such as employment, GDP growth and internal and external migration in each area in Australia. This included a review of a large number of sources, particularly from RBA and ABS. Therefore, unsurprisingly, our top OTP areas focus on Sydney, Melbourne and to a lesser extent, Brisbane and its surrounding cities. Our second step was to analyse the aggregated number of new dwellings in each area and then to identify the Top 100 Danger Zones across the country. In addition to the ‘usual suspects’ in inner-Melbourne and inner-Sydney, our list contains a large number of suburbs that were considered as a surprise, such as East Brunswick in Melbourne. Our reports contain many suburbs that might surprise our clients. Next, we identified specific suburbs; the preferred dwelling and dwelling configurations that carry a moderate level of risk; and the areas projected to deliver a solid capital growth in the medium and long term. We identified 25 suburbs in Sydney (20 units and 5 houses), 20 suburbs in Greater Melbourne (10 houses and 10 units) and 15 suburbs in Brisbane and the surrounding cities, all of which are houses. 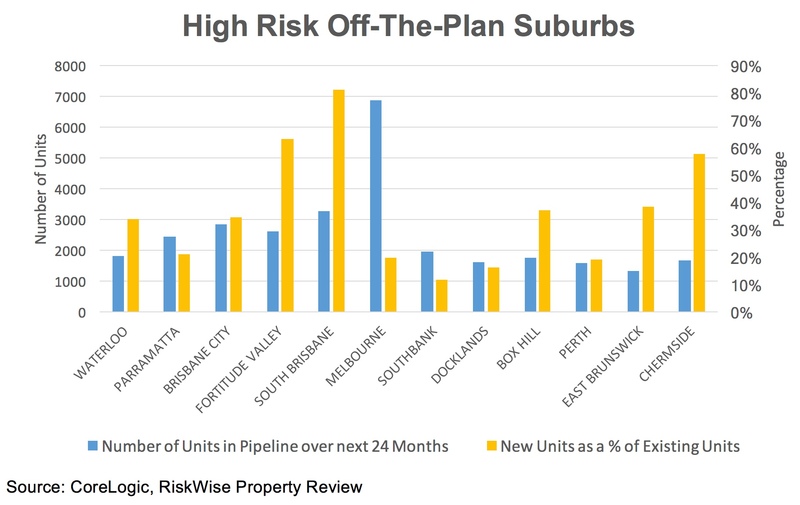 While there was a small number of suburbs in Brisbane where OTP units have the potential to deliver a solid capital growth, the risk associated with those investments is beyond the required threshold. A prime example of an area that is projected to deliver a solid capital growth in the long term, and currently carries only a moderate level of risk, is a large unit in Lane Cove. This is a great family-oriented suburb, with good quality schools in the north shore of Sydney. The median house price is currently exceeding the $2m mark, and as a result large units are an affordable dwelling alternative among owner occupiers. Therefore, the suburb has delivered, and is projected to deliver, a strong capital growth in the long term. Other suburbs were also hand-picked in the upper and lower north shore of Sydney. Another example for OTP houses are some suburbs in the Geelong area, where there is a strong demand for affordable houses with a relatively good proximity to Melbourne. In addition to the suburbs that are included in our reports, there are other good quality suburbs that haven’t made it to our list, mainly due to a smaller number of dwellings, which is associated with greater risks in itself.